My week started with a very chilly walk to ballet but the cold was offset by the wonderful colours as the sun came up. I have a slight obsession at the moment with dawn and dusk skies. Sometimes the colours just blow my mind. Nature is a wonderful thing people! They have been around for about 27 years and were the pioneers in top notch, ethically sourced food and drink. Their organic boxes are made to fit your lifestyle. If you don’t like bananas swap them for something else.. I like this concept as everybody likes different things. I swapped out the apples and oranges from my “Keen Cook” box for a mango and pomegranates. I fancied a touch of the exotic! A full post went live on Thursday with recipes using every single piece of fruit and veg from my box. If you haven’t read it yet here is a little taster to whet your appetite. Thursday was my well deserved day off. 2016 has started off so, so busy! I shouldn’t moan as I love being busy but when it’s all work and no play it’s not so much fun. I had some lovely things planned for Thursday.. I had crammed in as much as possible! First things first was a trip to see my friends Shillingford Organics at the farmers market. I had wanted to pick up some local honey from them so I could recreate a cheese recipe that I had had when I visited Italy last year. They had sourced a local honey from Alphington for me. They really are the most helpful group of people. I also purchased some honey with ginger from Peter Hunt from North Bovey. A really strong taste of ginger but truely wonderful. He recommended pouring it over vanilla icecream which I will definately do. Sounds delicious. For that particular cheese and honey dish I needed some amazing bread and obviously my point of call was The Almond Thief Bakery. I know I’ve said it many times but their sourdough is truely wonderful! After the market we popped to The Real Food Store Cafe to warm up with a cup of tea. The cafe sits above the Real Food Store in Paris Street. Everything in the cafe is available from the store downstairs. Steve’s parents were visiting as it was his dad’s birthday so after the market and our warming cuppa we raced back home to meet them for lunch at the Old Firehouse. Steve’s mum, dad and brother came down. They love the Old Firehouse and it’s a short walk from the house so it seemed like the perfect choice. I had their soup of the day which was brocolli and cauliflower cheese, Steve had the beef and ale pie, Steve’s mum had lasagne, Simon had the sweet potato and chickpea curry which was the special of the day and Les (Steve’s dad) had fish and chips. As always the food was cooked well and very tasty. It’s really good value in there too. I talked the guys out of dessert as I had made some scones in the morning to have with a cup of tea. Out came my favourite teapot from Bell and Blue and my vintage china. I barely had enough room for a scone with clotted cream and jam but thought I should try out my baking skills! I will be making a lot of scones next month for my Tara’s Busy Kitchen presents afternoon tea event on the 28th February. They were a good batch so will continue with this recipe from Edward Watts. (Riverford Field Kitchen). He passed on the recipe to me a month or two ago and really works. Thursday evening continued on a foodie theme when I got my Veg In A Box delivery. I will be doing a full review of the ordering system, their delivery and the quality of the produce at a later date. I will no doubt throw in a few recipes too. I can’t help myself! Just for the record though I can’t really fault anything so far and the customer service has been amazing. Once the box had arrived and put away I had two more guests arrive. My old chums from way back Cat and Jemma. I had prepared some yummy salads for us alongside some homemade houmous. The first salad I prepared was a roasted baby carrot and pearl barley. The second was a garlic and herb roasted celariac and avocado salad. To follow we opened some wonderful Godminster cheddar and my new Alphington honey from Shillingford Organics. So good and the flavours brought back many memories of my holiday in Trevignano Romano last year. God, I want to go back… It is such a beautiful place set on a lake in an extinct volcano. Heaven! I have been working on my pancake recipe for Shrove Tuesday on the 9th February. It’s a really easy recipe that anyone can manage with no need to weigh any ingredients as it is all measured in a cup or mug. The pancake recipe will go live next week in time for you to make them for “Pancake Day”. 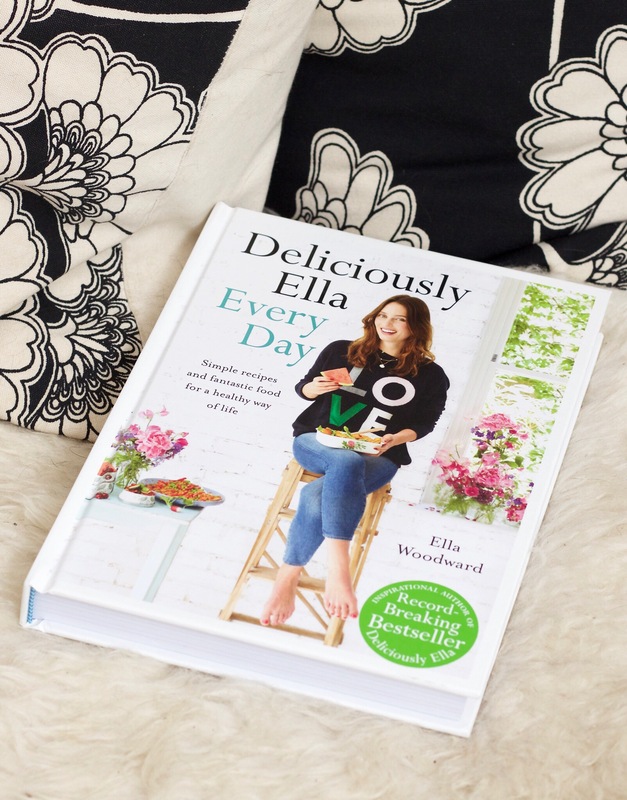 I purchased Ella Woodwards new book Deliciously Ella Everyday. It looks like it’s going to be a good read. I loved her first book as the recipes were fuss free. Exactly how I like to cook. This book looks like more of the same. I’m already eyeing up the recipe for the courgette banana bread and the double chocolate cheesecake brownies.. How good does that sound? Friday was a difficult day at work that culminated in a bit of tea and sympathy at The Plant Cafe to get my head together again. Not only was the tea just what the doctor ordered but they were playing Prince in the background. Prince is my all time favourite artist and musician from when I was growing up and I still hold him in high regard. Hearing the music change to Prince’s self titled album from the late 70’s was the perfect pick me up alongside my hot cuppa. It got me out of my low spot thankfully so I could go back to work and finish my day. Steve helped cheer me up by sending me cute raccoon videos and pictures via text. The mixture of tea, Prince and raccoons was a winning combo! Steve and I braved the wet and the cold on Saturday afternoon and ended up in The Globe. A cool pub in the Newtown area of Exeter. We bumped in to Hazel from Bedboat magazine. She had a copy of the brand new issue two of her magazine. I was lucky to be able to have a little flick through and stumbled across a rather wonderful looking recipe involving cockles and spelt. I will need to get down to Lorna Ruby so I can buy a copy as I need that recipe in my life! Next week I’m excited to be involved in some breakfast recipe development at Base + Barley. They are launching their breakfast and brunch menu soon and I get to help choose what makes the cut! How cool is that? I can’t wait. Alongside that I have a “date night” planned with Steve at Artigiano for their open mike night and a spot of dinner. That should be good fun.. I will let you know how it all goes next week. In the meantime look out for my easy pancake recipe for Shrove Tuesday. Photo credit to Steve Kitch.